Russian Deputy Prime Minister Dmitry Rogozin and Indian Defence Minister A.K. Antony discussed the introduction of the BrahMos supersonic cruise missiles in the Russian Naval fleet, with an eye on reinforcing bilateral cooperation in the military sector. During the meeting between visiting Russian Deputy Prime Minister Dmitry Rogozin and Indian Defence Minister A.K. Antony last week, India asked Russia to start inducting the 290 km range BrahMos supersonic cruise missiles in its naval fleet to further strengthen the joint venture between the two countries, Indian Defence Ministry sources told PTI. The two sides had formed the joint venture to produce the supersonic cruise missiles in 1998 and since then, all three wings of the Indian armed forces have ordered BrahMos for their inventory but the Russia is yet to follow suit. The Russian Deputy Prime Minister visited the BrahMos complex in New Delhi, where he was briefed about the capabilities of the different varieties of the missiles. Assuring his full support to BrahMos Chief Executive A Sivathanu Pillai, Rogozin said, "BrahMos is not only a successful joint venture but also a model for cooperation which has immense political value for our two countries." During the visit, Rogozin was also shown the development of the various variants of the missiles and the future plans of the joint venture company including a futuristic vision plan for 2050. Rogozin was accompanied by Russian Ambassador to India Alexander Kadakin, Head of United Aircraft Cooperation Mikhail Pogosyn and Head of Rosoboronexport Isykin Anatoli during the visit to the complex. The Indian army has already inducted the BrahMos supersonic cruise missile, a precision-strike weapon with a range of around 290 kilometres. The missiles will likely be deployed in the state of Arunachal Pradesh in the northeast along the remote and contested border with China. According to reports in the Indian media, BrahMos missiles will "counter China's huge buildup of military infrastructure all along the 2,500-mile Line of Actual Control following a similar nod for the western sector facing Pakistan." BrahMos is based on Russian technology and is developed by BrahMos Aerospace - a joint venture company created in 1998. BMA is 50.5 percent Indian Government owned and 49.5 percent by the Russian Government. 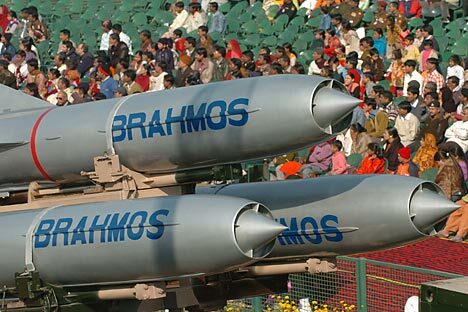 The name BrahMos is derived from two rivers, India's Brahmaputra and Russia's Moskva. Last year the Indian Government announced plans to have a reduced-weight air-launched version of the BrahMos on the Air Force's Russian-designed Sukhoi SU-30 MK-1 fighter aircraft by 2012. India is among the world's top 10 military spenders. It plans to splurge $50 billion by 2015 to upgrade its military and remains the biggest consumer of Russian military hardware. Russia “appreciates this strategic partnership,” Mikhail Dmitriyev, Director of the Federal Service for Military-Technical Co-operation told Russia Today. He said the countries plan to cooperate on a variety of projects, including BrahMos, fifth-generation fighter aircrafts and the development of a military transport plane. This article was based on reporting from RIA Novosti, Russia Today and PTI.